The nursing lab at Brock University was a flurry of activity on a recent Monday afternoon as 32-year-old Lindsey Simm gave birth to her second child. A healthy baby boy weighing just over seven pounds was born at 3:52 p.m. in front of nearly 50 second-year nursing students. But this was no ordinary delivery. Simm is one of Brock’s High-Fidelity Simulation Mannequins. She labours, has lungs that breathe, a heart that pumps and can even tell you what she’s feeling. Taplay said realistic simulations provide students with practical experience in a safe teaching environment, where mistakes can be made without concerns over harming the patient. Helping to lead the birth simulation were Niagara Health registered nurses and graduate students Kim Bowen, Breann Hadley and Amanda Hansen. 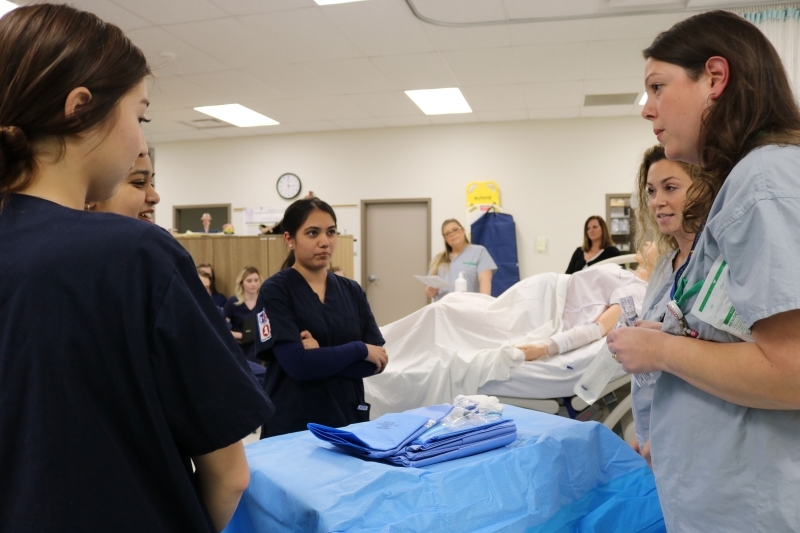 “As a current clinical instructor for the nursing program, I was given the opportunity to collaborate with two of our community partners at Niagara Region Public Health to create a real-life patient scenario for our students,” said Bowen. With the help of Child Health Manager Jeff Biletchi and Healthy Babies/Healthy Children Manager Amanda Hicks students were provided with an educational experience not possible in a clinical setting. “Some of the major benefits to this type of simulation exercise are not only providing the element of reality, but also being able to slow down, educate and provide answers to questions, which isn’t always possible in a delivery on the unit,” Bowen said. “We even take the time to demonstrate ways to assist the patient in changing positions to better help her birth her baby,” Taplay said. Also in attendance was Brock alumna and Clinical Manager of the Women’s and Babies’ Unit for Niagara Health, Heather Gallagher, who said it was a great opportunity to help future nurses understand what actually happens during birth. “It’s one thing for us to talk about it with them, but once they’ve actually seen it, it can be life-changing,” she said. To help increase the reality for students, the Women’s and Babies’ Unit from Niagara Health lent Brock’s Department of Nursing delivery specialized equipment for the simulated birth. “There was a lot of equipment used in the simulation which instructors need access to for teaching purposes,” said Gallagher. “We know the importance of these items, and letting Brock borrow them provides a great learning opportunity. “I loved when I went to Brock, even though we didn’t have the simulation labs we do today. I think it’s so important for our community and for our youth to be able to stay here and learn with the nurses who have been here their whole lives,” she said. As part of the community partnership between Brock University and Niagara Health, the Women’s and Babies’ Unit at St. Catharines Site offers second- and fourth-year nursing students experiential education opportunities. As the simulation ended, second-year Brock nursing student Samantha Gracie was given the opportunity to name the newborn baby. Her answer: “Isn’t it obvious? We go to Brock. I pick the name Isaac,” she said. Photo caption: Brock University nursing students, including Gurleen Gill (centre), learn how to prepare the delivery set-up table from Niagara Health Registered Nurses Amanda Hansen and Kim Bowen with equipment on loan from Niagara Health’s Women’s and Babies’ Unit.